Hello fun times with friends and family! Hello pretty lights, festive decorations, beautiful music, and special traditions. Hello to excessive baking and sweet treats, to gift giving, and doing good deeds. Because I love this time of year so much, I have even created special holiday traditions and features here on Kitchen Concoctions. For the past two years for the first 12 days of Christmas (December) I shared 12 breakfast recipes that would be perfect for Christmas morning. I mean really who doesn’t look forward to a special breakfast Christmas morning after seeing what Santa brought while lazily sitting around in your pj’s. But this year I have decided to change things up a bit. Don’t worry if you still need some Christmas morning breakfast ideas click here or here for a whole slew of recipes. But this year, I decided to feature ‘homemade gift’ ideas for the theme of my 12 Days of Christmas. Since this season is all about giving, this is perfect. And since many of us are on tight budgets these days, having a few affordable homemade gifts (not to mention easy) up our sleeves will totally come in handy! Oh and while, giving plates full of cookies and treats are common this time of year, I wanted to think “outside the homemade holiday gift box.” I’m not saying that there won’t be any cookies involved, I mean after all they are an essential ingredient for the holidays, but I just want to share some other homemade gift options. It is extremely easy to whip up. Can easily be doubled or tripled. And stores well, so it can be made in advance or can be something you can whip up store in some cute jars to grab when you need to have a quick and readily available gift for someone. Because, really who doesn’t love bananas and peanut butter (that is unless you are allergic)! Packaging suggestion: For a cute presentation this granola can be placed in a mason jar or other decorative jar with a lid. Tie a festive ribbon around the jar or top with a bow for gift giving. 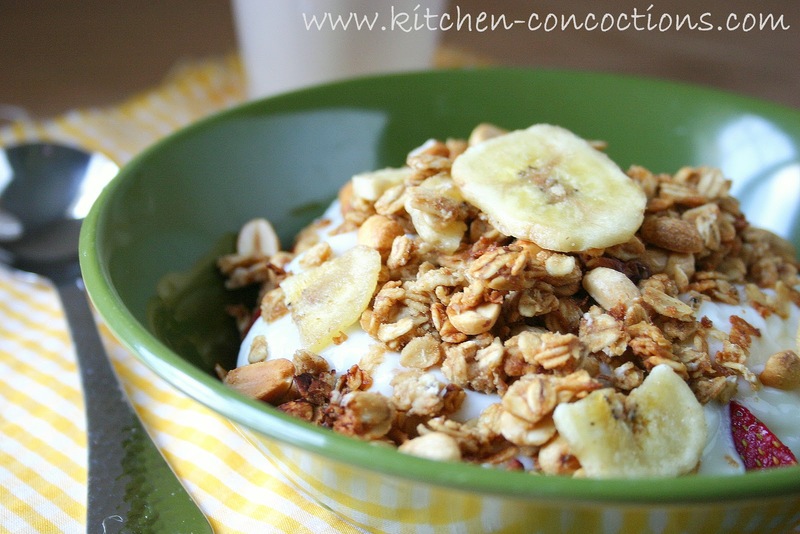 Give granola in jar by itself or with a small pint of milk and a cute bowl – I’m thinking perfect for co-workers! In a medium sauce pan heat first six ingredients over medium low heat. Cook, stirring occasionally for 2-3 minutes. Meanwhile, combine rolled oats and peanuts in a large bowl. Pour heated peanut butter mixture over rolled oats and stir to combine. Spread granola mixture evenly on baking sheet. Bake in preheated oven for 20 minutes, stirring occasionally, or until golden brown. Cool and pour into a large bowl. 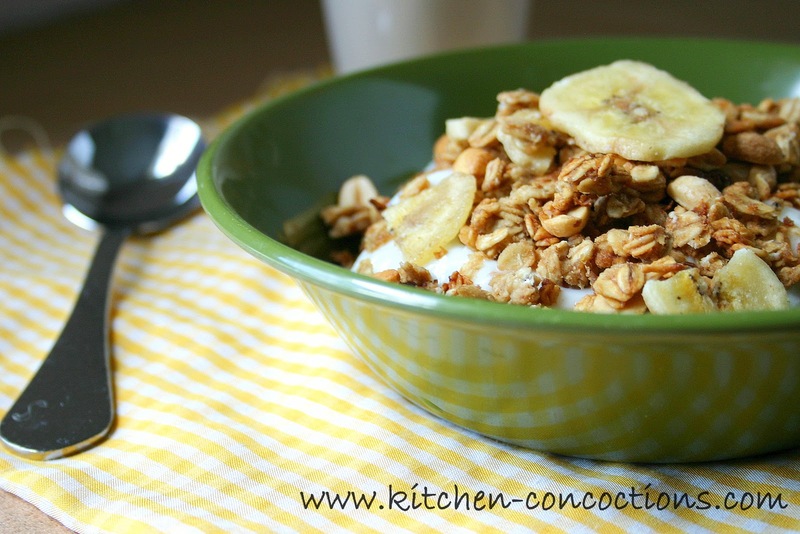 Stir in banana chips. Store in a plastic storage container or glass jar, tightly covered. Yum! 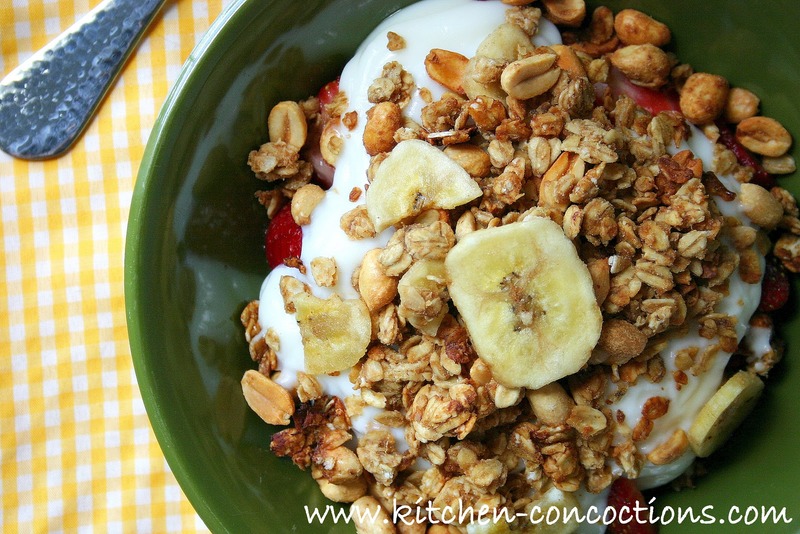 That granola looks so good.